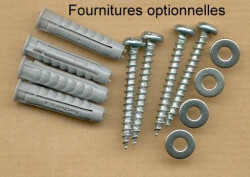 This set of 4 screws will help you to hang up your sign on a wall. Please don't use electrical tools to hang up your sign and do not squeeze too much the screws, it may damadge the enamel. We won't accept any claim if you break your sign with your srews or these screws as we tested it before.